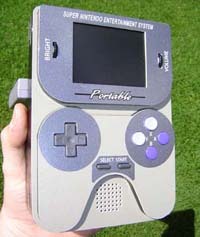 Build a portable SNES system with a 3″ TFT display, compact design and built-in battery pack. This project can be constructed by using CNC-cut parts and other hobby materials. You’ll also need a soldering iron, X-Acto knife, wire, screwdrivers and other common tools. Unlike Digi-Key, Mouser’s website has no minimum order so it’s handy for the experimenter, plus they have good prices. Please note that the items for modding the Casio TV screen (10 ohm resistors and white LED’s) are also included on this list. Using this list you can easily copy/paste the part numbers into Mouser’s web site (or Radio Shack’s, below) to complete on online order. Sure beats typing! You can get a good price on single Ni-MH batteries from Mouser, so they are listed below as well. You’ll need (6) AA’s total. Note the three choices available – the higher the mAh rating the longer they’ll last. Choose which fits your budget. A change: Since the printing of the book Radio Shack no longer sells rechargeable RC car batteries and chargers separately – now they’re typically in a “combo pack” Therefore with this project you may need to either just use regular AA batteries or buy a separate Ni-MH charging unit. Ask a Radio Shack employee what they have – if you can find a 9.6 volt RC car charger by itself then that’ll work. If you find a different brand or type of Ni-MH 9.6 volt battery charger it should work with this project. Be sure the check the polarity of the wiring before attempting to charge the batteries inside the SNES. In the SNES chapters (all 3 of them) it suggests using the “4021 shift register” chip from a NES controller to build a SNES controller. Specifically you need 2 of them. Thing is, this ends up wasting 2 Nintendo controllers which aren’t always easy to find. The solution is to simply order replacement shift registers from an online vendor. The Digi-Key part # is 296-2040-5-ND, Mouser part # is 595-CD4021BE. You’ll need (2) for a SNES project, but they are dirt cheap. I was wondering if you still had any c&c cut snes cases? I’ve got your book and I’ve been meaning to do the project for several years. I initially tried the handmade case and failed miserably. Thanks and best wishes!